Despite all the talk of automation and robotics, no one knows exactly what the future’s workforce will look like. 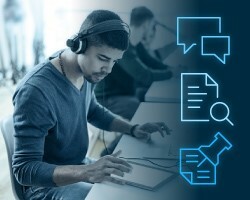 What people can say, however (indeed, what many say is common knowledge) is that the business world is changing dramatically: companies are leveraging more technology, relying more on independent contractors, and racing to keep up with customer demands that change as quickly as the trends on Twitter. All this makes recruiting tech talent even more difficult than it was already. Not only are employers struggling to identify and recruit the best candidates, they’re focused on candidates who can start performing as soon as they begin a new role, who will fit with team and company culture, and will understand how to communicate appropriately with both customers and colleagues. Besides making life easier for recruiters and hiring managers, assessments have tangible benefits, Kelly noted: By improving candidate selection, they help employers save recruiting dollars, increase retention, and build up company performance. When it comes to hiring, employers typically rely on two types of assessment, said Tiffany Shortridge, North American Talent Assessment Leader for Saville Assessment, a unit of Willis Towers Watson. The other type, aptitude assessments, examines different areas of an individual’s cognitive ability, such as their verbal talents or knack for solving problems. The idea is to give the recruiters and hiring managers an indication of whether a candidate will perform well in a given role. But don’t confuse these assessments with skills tests. For one thing, skills tests are more granular. They measure subjects that people can learn, such as knowledge of C++. “Skills are something that you learn, and/or something you can be trained on, on the job,” Shortridge said. In a nutshell, assessments help employers better match individual candidates to individual roles. For example, Kelly said, a consulting company may need sales engineers whose skills go beyond technology: “Someone who can speak like a salesperson and handle situations in a salesperson’s way, while still being technical and having that engineer job title.” Assessing pertinent traits before putting candidates in a role increases the odds they’ll succeed, he added. A number of technology organizations use assessments to evaluate general areas of a candidate’s aptitudes and behaviors. For example, coders—who may be more introverted than other professionals—might be assessed for their ability to work on a team or on projects that cross organizational lines. In particular, Shortridge is seeing more interest in assessing candidates for data privacy and data security roles. For those jobs, employers are more interested in a person’s behavioral traits, not just their technical proficiency. Often these organizations are looking at leadership potential, since the need for data-privacy and data-security talent is growing rapidly. Tech pros in these positions often have to work with a number of other areas within their organization, so leadership skills, team orientation and a high level of conscientiousness are necessary to succeed.